Emblem of the Coastal Shield Brigade. On top: "Coastal Shield Brigade." In middle (with portrait of Bashar al-Assad): "Republican Guard. Knights of Assad." 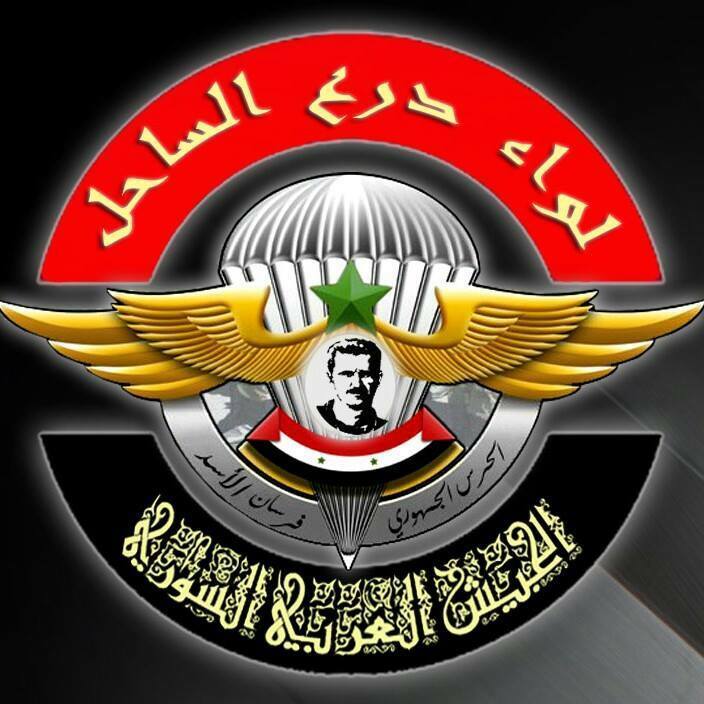 On bottom: "Syrian Arab Army." As the Syrian civil war has dragged on with no recent decisive breakthroughs for the Assad regime and the loss of many peripheral territories including all major towns in Idlib and Palmyra, the problem of avoidance of conscription into the regular armed forces has only become exacerbated. Thus, at this point, a strategy of entrenchment and defence of vital areas seems most reasonable to ensure the regime's survival, having locals recruited instead to focus on defending and retaking territory within their own provinces. For example, this approach is now well in evidence in the predominantly Druze province of Suwayda, which has remained under regime authority but is now threatened on two fronts by the Islamic State to the northeast and the Deraa insurgency to the west, with many Druze refusing to serve in far away fronts to no avail. The formation of the Coastal Shield Brigade (Liwa Dir' al-Sahel) for Latakia province is part of the same trend. Indeed, Latakia also finds itself under increasing threat with the Idlib losses, and even some of the Iraqi Shi'a militias deployed in Syria, such as Liwa Dhu al-Fiqar, have played a role in contributing manpower and fighting in Latakia province in recent months. "The Republican Guard announces the formation of the Coastal Shield Brigade accepting those who desire recruitment contract for two years, or permanently, and in reserve and compulsory service, as well as for the sorting out of affairs for those who avoided the reserve and compulsory military service call and deserted before 1 January 2015. Salaries will be paid with monthly remunerations reaching up to 40,000 Syrian pounds. 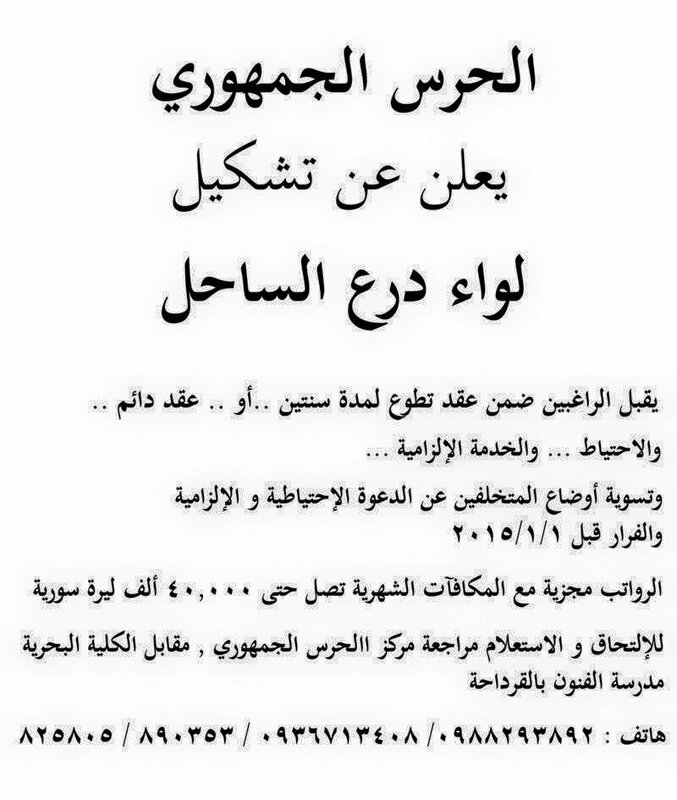 To join and inquire, head to the Republican Guard centre opposite the Naval College, School of Arts in al-Qardaha. "The Republican Guard, Coastal Shield Brigade, is accepting those who desire recruitment contract for two years, or permanent, and required for reserve and compulsory service. Commission is accepted for employees in government foundations and offices. Sorting out of affairs for desertion and those who avoided service before 1 March 2015. Ages from 18 to 45 years. Service on the Coast [Latakia]. 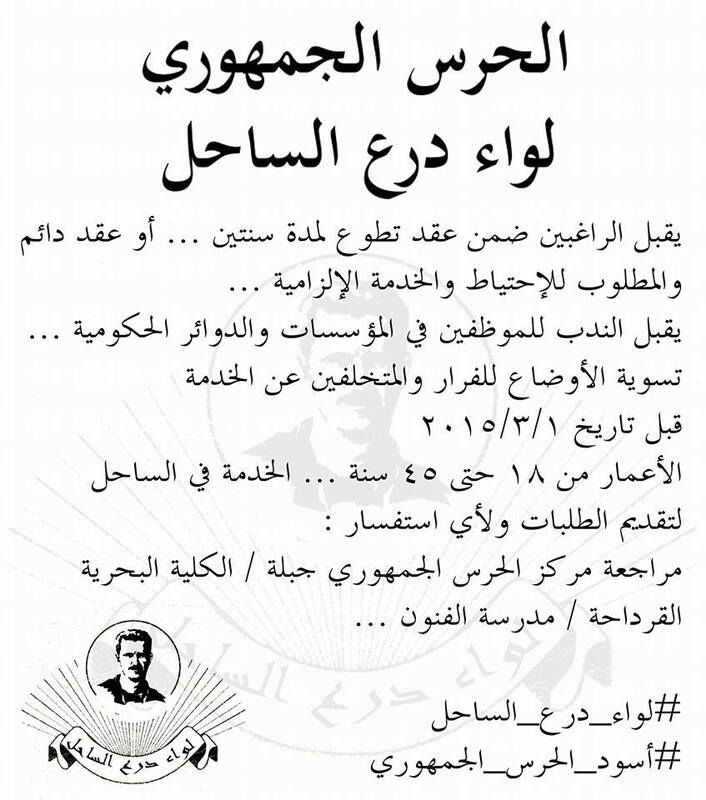 To submit applications and for any inquiry, head to the Jableh Republican Guard Centre/al-Qardaha Naval College/School of Arts. Lions of the Republican Guard." On 20 June, the Coastal Shield Brigade reiterated the advertisement for recruitment, announcing that the doors for recruitment would be closed soon. But on 28 June, some clarifications were noted: first, by order of the Defence Minister, the issue of 'sorting out affairs' would only apply now to those who deserted from the ranks of the Republican Guard, on account of the supposed large number of recruits and applicants to the Coastal Shield Brigade. Second, the recruitment contract of two years would take into account compulsory military service. As far as required documentation goes, one should submit a personal photo and ID photo. So far, evidence of significant operations for the Coastal Shield Brigade has been somewhat limited, but on 9 July the militia announced its first fallen fighter in one Ibrahim Makana, who died fighting in the Kherbat Sulas area towards the north-east of Latakia province, which continues to remain under insurgent control. It remains to be seen how effective the Coastal Shield Brigade will be as a fighting force as there has been no major insurgent offensive to push deeper into Latakia province since spring 2014 when a variety of groups spearheaded by jihadists seized the Armenian Christian border town of Kessab (desecrating the churches there despite rebel media attempts to downplay this) and reached the Mediterranean Sea. The Syrian army, bolstered by the elite Desert Falcons and irregular forces in Latakia province such as the Muqawama Suriya, eventually retook all the lost ground, but the process was sluggish and dragged out until June of that year. Further, the Muqawama Suriya's own effectiveness was put into doubt with therapid losses of Idlib city and Jisr al-Shughur in the spring of this year, as the group had a notable presence in both places. Meanwhile, the Desert Falcons failed to prevent the loss of Palmyra and other towns in Homs desert to the Islamic State. These developments besides the potential high salary may add to the attractiveness of the Coastal Shield Brigade as an alternative local defence force that at the same time purports to counter the problem of breakdown of regime authority on account of proliferation of irregular armed groups.